The last time I was at White Sands was three years ago for the White Sands Balloon Invitational. Since then, they have been launching the balloons from a park in Alamogordo; somehow, it’s not quite the same. So, it was a pleasant surprise when I discovered that the balloons would be launching from the monument again this year. One of the first things I noticed about the dunes was the softness of the texture. Usually, the ripples are sharply accentuated, and side lighting makes them stand out. But, now they were softer, probably from the effects of wind and rain. The whole feel of the place was different from other times I have visited. The result was a calm and peaceful energy that found it’s way into my photographs. A distant figure walking on the dunes became a dream-like vision. The rain falling on the San Andreas Mountains twenty miles away was transformed into a sheer curtain partially obscuring the mountains. And all of it was lit by a soft, gauzy light. As the sun began to set, the sky was ablaze, and the dunes were dressed in evening blue. it’s rare that I am so excited by a scene that I can feel my pulse quicken. It was well past sunset when we had to leave for the night. But, I was quite satisfied with the images I had made, and I was looking forward to the balloons the next day. The next morning, we awoke at 4:30 in order to be at the gate in time for the 5:30 opening. After driving to the parking area near the picnic areas, we set out onto the dunes to find a good spot from which to photograph the mass ascension. But the sky to the east was dark and the winds aloft delayed the 7 AM launch time. We meandered around the dune field making images and soon lost track of time. By about 9:30 we began to realize that the launch was not going to happen. It was somewhat disappointing, but we were having such a good time with our cameras, we soon got over it. Once again, the atmospheric display made a stunning backdrop for the never-ending story playing out on the dunes. The dark sky provided a stark contrast to the white sand, and the soft glow rendered by the overcast made a fitting palette for the dunes and the soaptree yuccas. 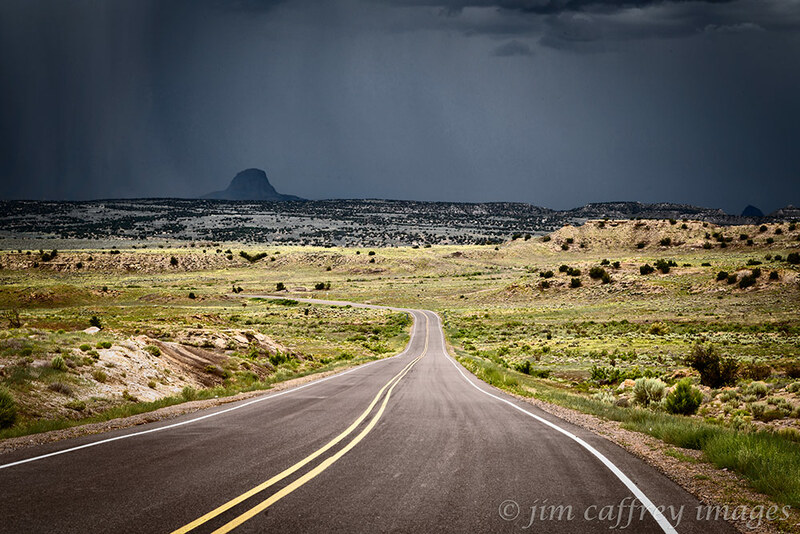 My previous post: Roaming The San Juan Basin-Part 1, was about the first day of a two-day road trip through the expanse of a great bowl shaped depression in the middle of the Colorado Plateau in northwest New Mexico. 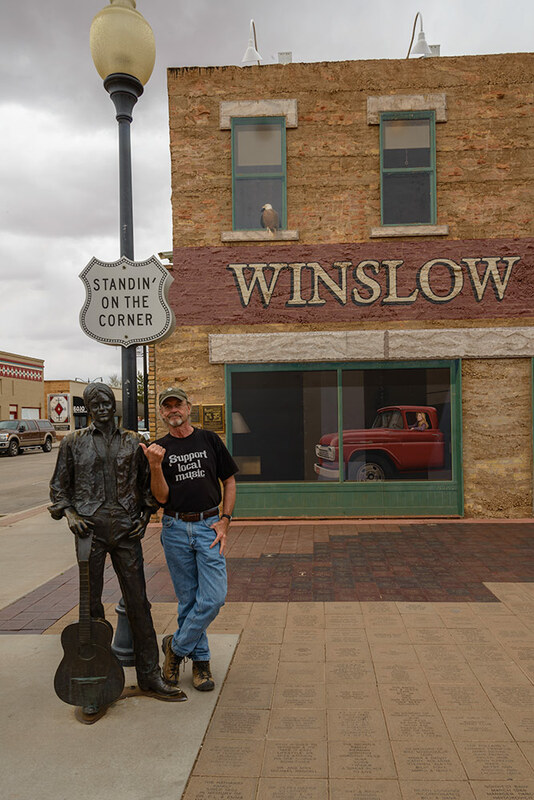 I spent Saturday night in Farmington and awoke early on Sunday. I had planned to head straight home from there, but as I prepared to leave, I thought better of it and decided to do some more exploring. As I drove up the road that leads from Farmington to the edge of the basin, I began to formulate a plan. I decided that I would avoid any of my normal haunts: the Bisti Wilderness, Ah Shi Sle Pah, etc. and that I would try to stay on dirt or gravel roads as much as possible. With this blog post in mind, I also decided to take a photojournalistic approach to making my images as opposed to my usual process. 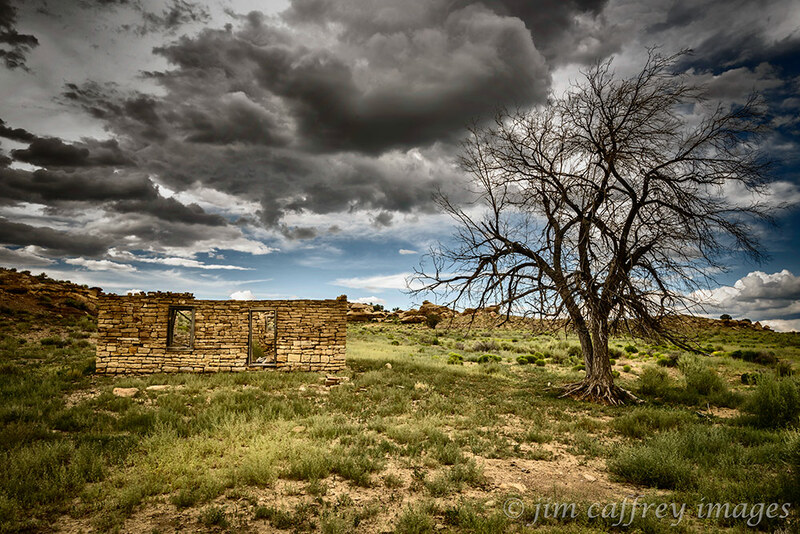 I left the paved road about forty miles south of Farmington and immersed myself in the rolling, broken landscape. The San Juan Basin has numerous drainages of all sizes that carve the washes and valleys that form the irregular surface and expose the long buried geological features. I turned south on a road I knew would take me past Ah Shi Sle Pah…forbidden territory on this trip. I noticed three abandoned dwellings off to the west. The walls were of rock; the roofs, non-existent or barely there. They had a melancholy look to them; it was as though they were being swallowed by the great expanse that surrounded them. A few miles further along the road, I saw a band of horses; one group of seven animals, and a mare and foal off by themselves. I stopped the car and walked to the side of the road to set up my tripod and the larger cluster immediately moved farther away from me. 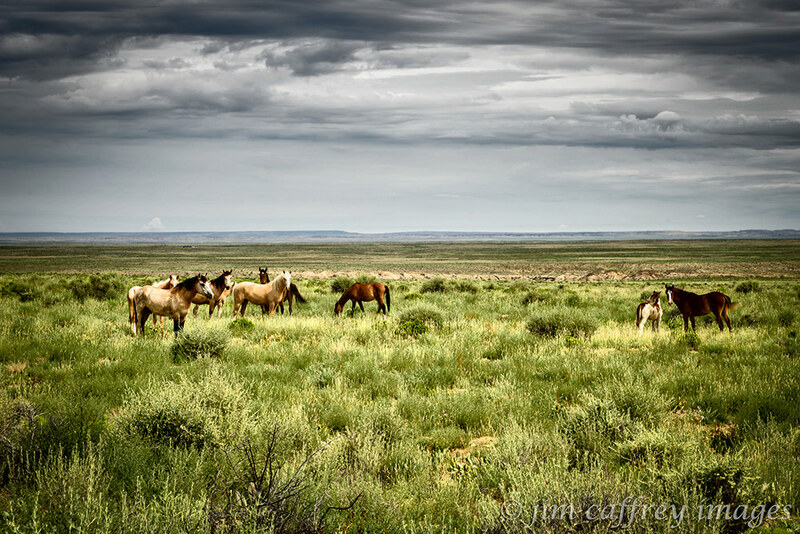 I made a few exposures and decided I would try to get closer, but the horses ran to the edge of the wash while the closest one–a stallion and probably the alpha–stood his ground and began to snort and pound the ground with his hoof. 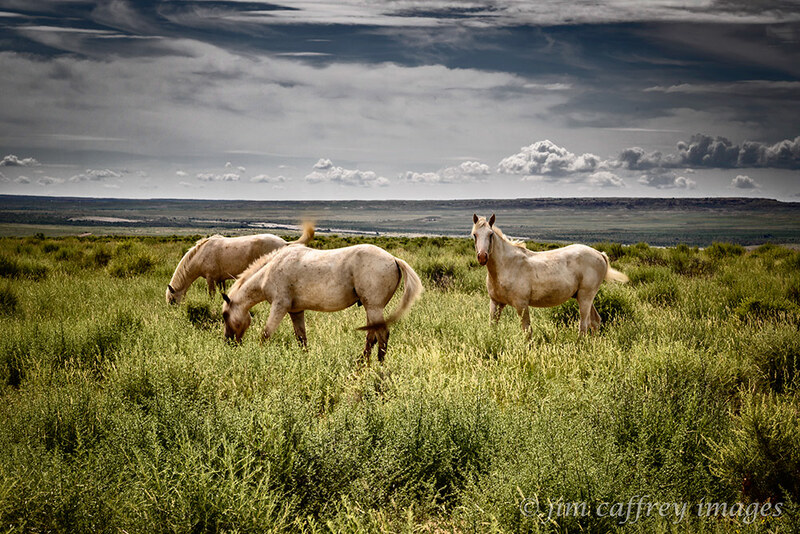 From this behavior, I surmised that this was a wild band; the tame horses I have encountered are typically friendly and will even approach to within an arm’s length. I took the hint and returned to the car. I didn’t want to alarm the animals any more than I already had. I didn’t make it more than a half mile further when I spotted a smaller group of three white horses on the south side of the road. These were more friendly, but still more stand-offish than usual. They continued their grazing, but were wary of my presence. Now I dropped down into Kimbeto Wash, a key drainage for this part of the San Juan Basin. I came to a tee in the road; to the left, Ah Shi Sle Pah, to the right, unknown territory. I turned right and crossed Kimbeto Wash. Less than a quarter mile further along was a road to the left and a sign: Chaco Canyon miles. The mileage was illegible. Onward. I was excited to find a back way into Chaco; connecting the dots on a map has always been satisfying for me. The road crossed a grassy plain with a low mesa on the southern horizon. The only other visible feature was a lone hogan about a hundred yards off the road to the west. After about ten miles there was a sharp left turn and the track dipped down and crossed Chaco Wash before continuing up to the top of a high plateau. 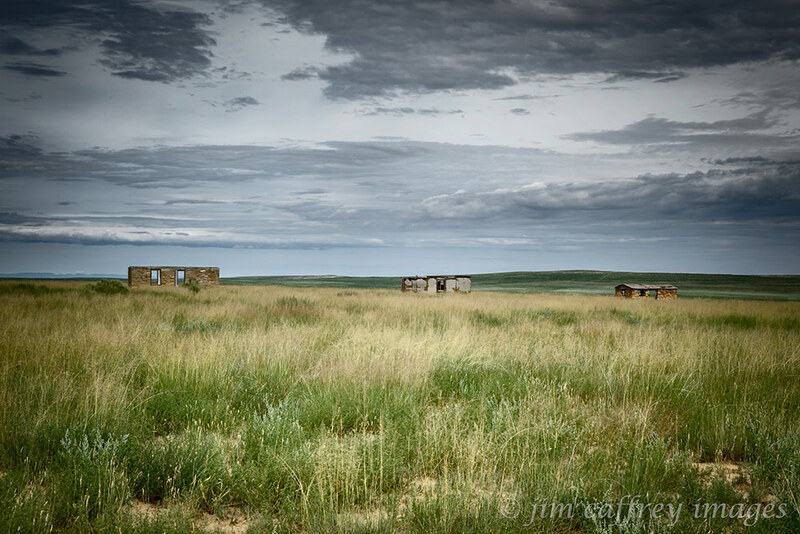 By now, I was firmly into a spontaneous wandering frame of mind; I took a turn onto a two-track that seemed to lead to the plateau’s edge, but the road curved back and dead-ended at an abandoned homestead, complete with old cars and trash burn barrels. 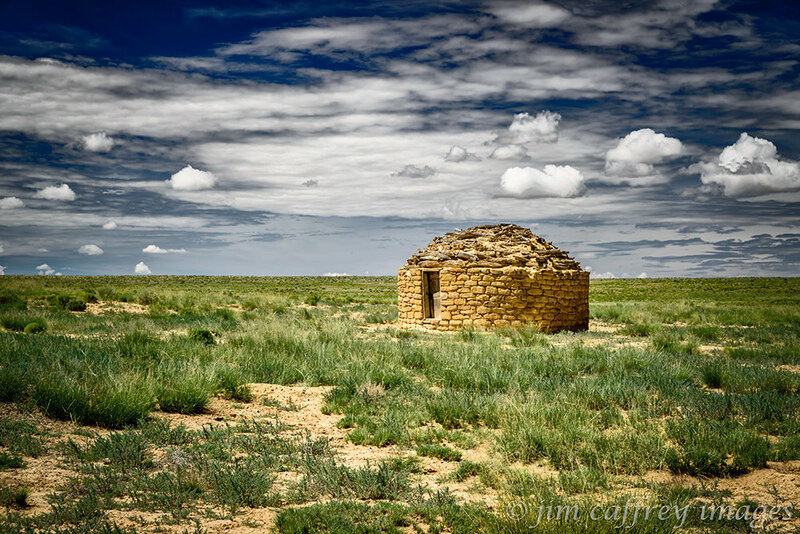 I’ve seen hundreds of these forlorn dwellings scattered across the remote desert areas I frequent. They always put me in a pensive mood. 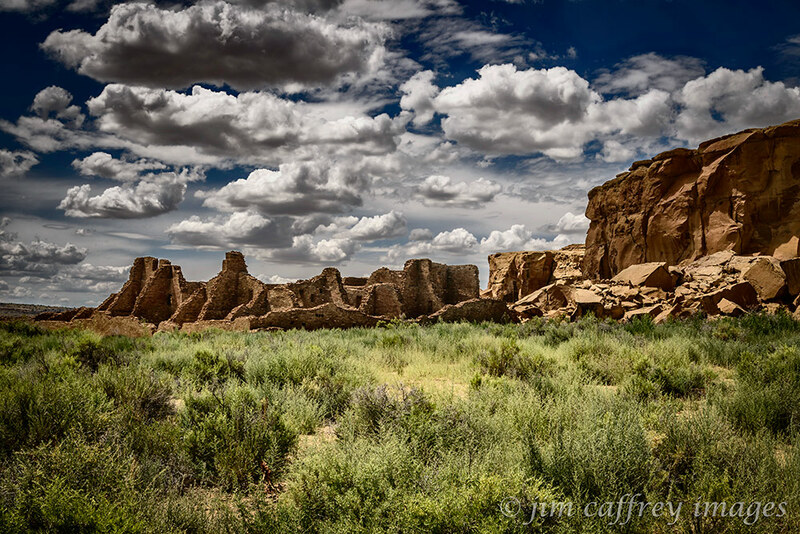 Back on the main road, I soon came to an intersection that put me on the main road into Chaco Canyon. I decided to make a quick tour of the loop. 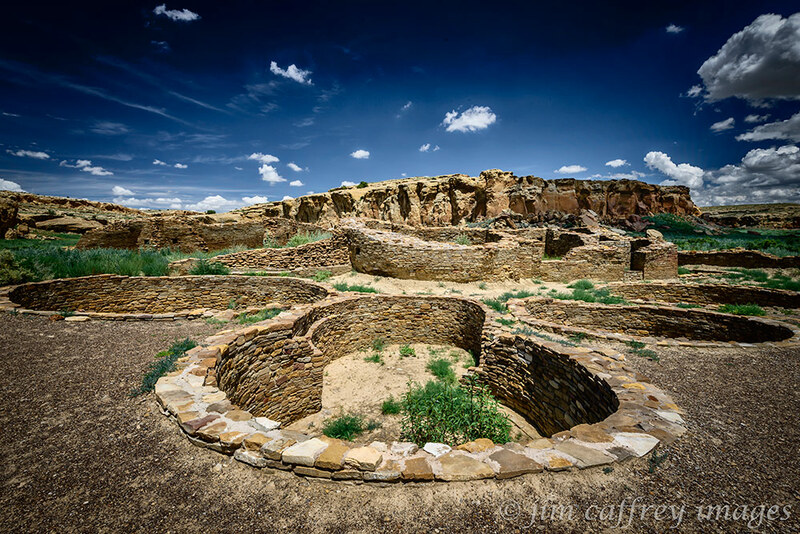 One of the most interesting elements of the ancient pueblo culture for me is the kiva. There are different kinds of kivas: many were used as places for social gathering, but most of them were ceremonial in nature. These adjacent kivas at Chetro Ketl–the second largest pueblo complex in Chaco Canyon–were used for religious ceremonies. Standing near these centuries-old subterranean enclosures made me feel connected to the ones who contrived and built these amazing communities. Chaco Canyon is actually comprised of many pueblo complexes which were built over a span of four centuries and housed thousands of permanent residents and visitors from outlying sites. Of these complexes, Pueblo Bonito is the largest with more than eight hundred rooms. Like most of the pueblos in Chaco Canyon, Pueblo Bonito is built close against the wall of the mesa. A little further along the loop road from Pueblo Bonito is Pueblo del Arroyo. It is situated along the edge of Chaco Wash and had three hundred rooms; it is thought to have been built by residents of Pueblo Bonito who moved due to overcrowding in the larger site. I had already spent more time at Chaco Canyon than I wanted to, so I made for the exit that brought me to Hwy 57 heading south. 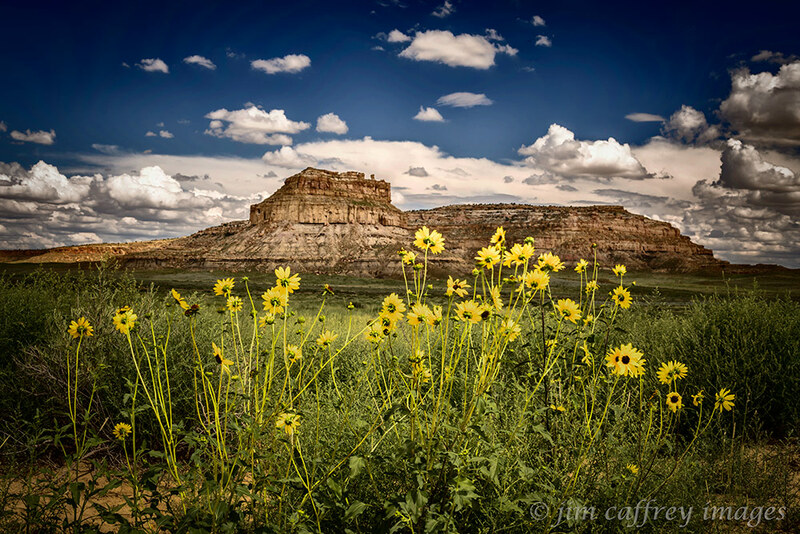 As I passed the boundary I stopped to make a photograph of Fajada Butte which rises 440 feet above the canyon floor and is home to the most famous of all the Chaco sites: The Sun Dagger site. Three slabs of rock are set up and arranged in such a way that shafts of sunlight shine through them and onto specific parts of a petroglyph carved on the rock wall of the butte on each of the solstices and eqinoxes. More proof that these early Americans were far more advanced than the “savages” they have been depicted to be. So, with these thoughts bouncing around in my head, I left Chaco behind and continued my exploration of the San Juan Basin. New Mexico State Road 57 is not what you might expect from the designation. 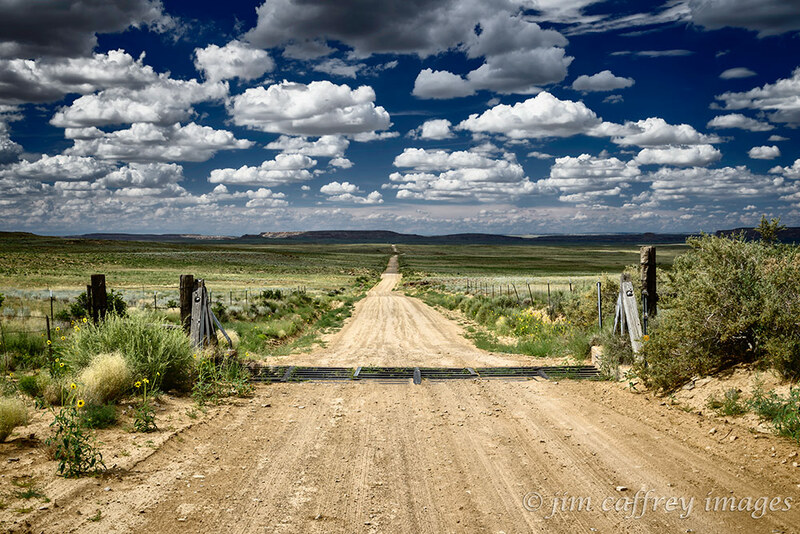 Soon after it starts at US 550 between Huerfano and Nageezi, it sheds its asphalt coat and becomes a dirt road in the truest sense of the word. A good rain will quickly turn it into a quagmire of greasy clay, the kind that will defeat even the most serious four-wheel drive vehicle. So, although I truly enjoy a good thunderstorm, I couldn’t help but hope that the building thunderheads would hold their water at least until I made it to the pavement of Indian Rte. 9 twenty-five miles to the south. 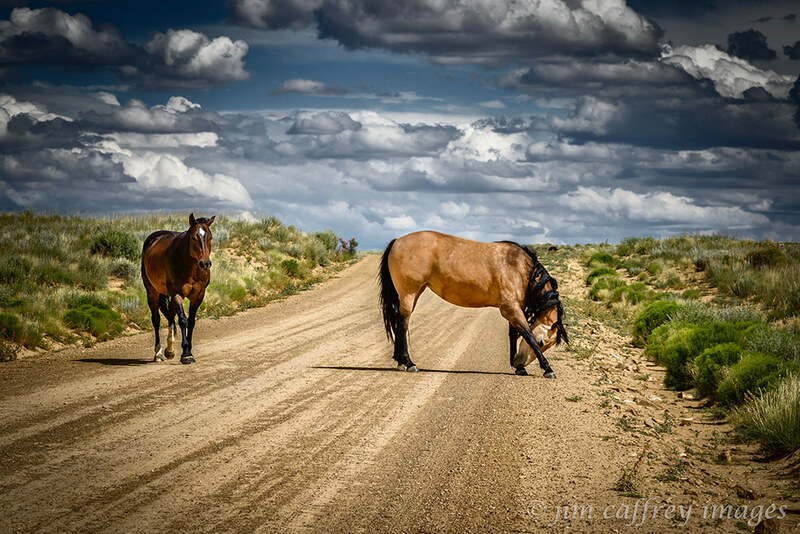 I was about half way between Chaco and the paved road when over a rise in the road came two beautiful horses. One of them, a mare, turned sideways in the road and seemed to be bowing to me. I was enchanted; I spent over half an hour with them and when I finally left them behind, it was with some reluctance. The remainder of the drive on NM 57 was relatively uneventful. There were a few small clusters of hoodoos and several small herds of livestock and then, suddenly I was at the intersection with the paved road. I looked back the way I had come, again with some reluctance, and then turned onto Indian Rte. 9. Almost immediately I came across three horses drinking from a water barrel. The scene seemed to say a good deal about the nature of this remote area, so I made a photograph of it. After its intersection with NM 57, Indian Rte. 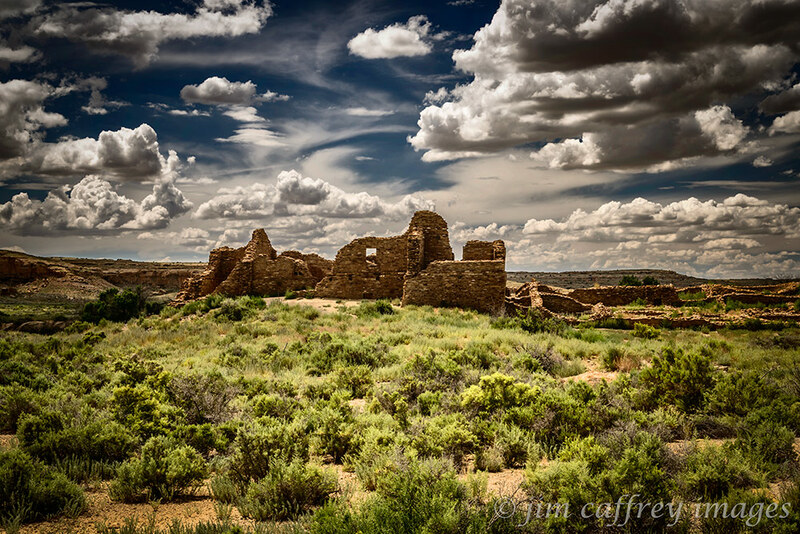 9 climbs onto a low mesa and emerges at Pueblo Pintado, an outlier of the pueblos at Chaco Canyon. This area is still inhabited by the descendants of the anasazi people, but now they live in houses scattered across the mesa in the shadow of the ruin that was their ancestral home. Another thirty miles brought me to Torreon. It is here that IR 9 becomes New Mexico 197 and turns northeast towards Cuba, NM. I turned onto an un-numbered, but paved road that runs from Torreon to the small village of San Luis in the Rio Puerco Valley. I passed a rock ruin that I had photographed before, but I stopped to make several exposures before continuing on towards San Luis. 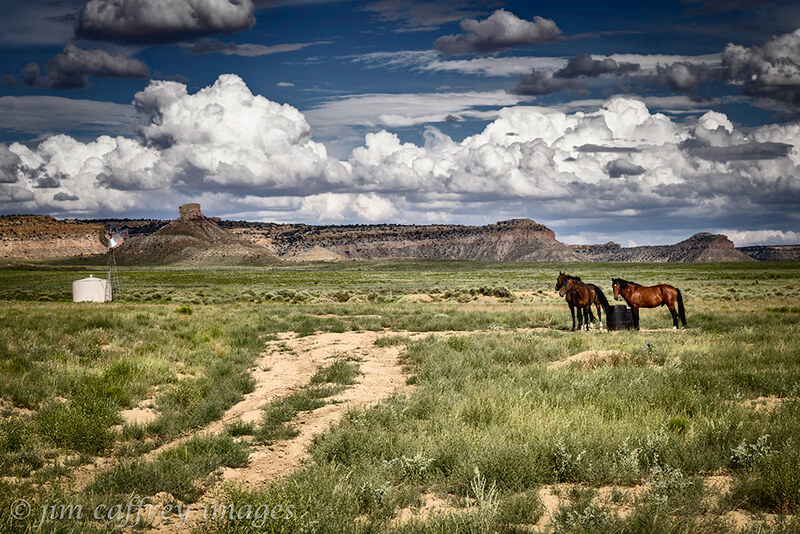 The Rio Puerco Valley is an arid place. The colors are usually limited to browns and sparse, muted greens. But, in a good year, when there are generous spring rains and a healthy monsoon, the desert comes alive; late spring, and early summer will see an abundance of colorful blossoms on the cacti, and the shrubs that grow and cover the landscape as far as the eye can see. Since we are currently experiencing those very conditions here in the high desert of northern New Mexico, I was excited to see a cane cholla covered with reddish-purple blossoms as I was driving home a few days ago. The next day I packed my gear and headed into the expanse of the Rio Puerco Valley, certain that I would find it full of blooming chollas. My expectations were confirmed as soon as I turned onto the county road that leads into the valley. The rolling plains on both sides of the road were covered with cane chollas and flowering plants in bloom. As I made my way through the small village of San Luis and deeper into the broad valley, my excitement grew. Everywhere I looked, it seemed, were colorful blossoms–mostly reddish/purple or yellow. The day was pregnant with possibilities; the weather was stormy, and as I watched from deep in the wilderness, a cloud opened and began dropping virga over the landscape. Virga is an observable precipitation that drops from a cloud, but evaporates before it reaches the ground. I managed to make several good images that contained the event before it dissipated. 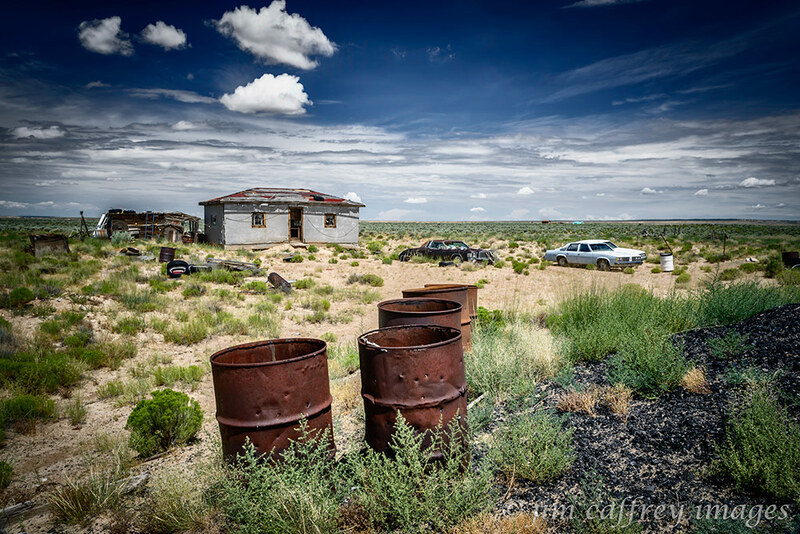 By the time I reached the ghost town of Guadalupe, I had already made over two hundred images and there was still plenty more to do. I parked the car and walked through the familiar landscape. 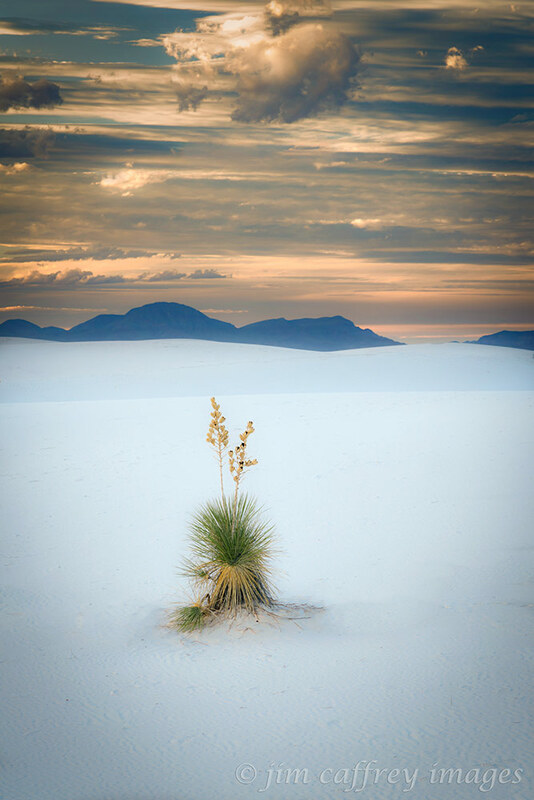 I had photographed in Guadalupe many times before, but never with the desert in bloom the way it was now. This was a remarkable contraposition between the hope of prolific reproduction and the disappointment of broken dreams. When you have photographed an area as much as I have photographed Guadalupe, it can be difficult to remain fresh, to create something new, but the chollas, which I usually see as just another part of the landscape, were now transformed into something more. I was able to see and use them as elements of counterpoint in my compositions. I think that made a big difference in how I saw the scene, and created the images. One image in particular required that I step out of the box. There is a section of wall that remains standing while totally separated from the rest of the building it had been part of. Several years ago, I made an image of the wall with a crumbling two-storey building visible through the door opening. Being a creature of habit, it tried (unsuccessfully) to frame both the building and a blooming cholla in the opening. I finally gave up, and as I was walking away, I turned and saw what became the above image. I love it when failure leads to success. After spending several hours working the location, I decided to pack up and head home. I made one last photograph before getting to the car to the drive back to the highway. But, before leaving I decided that I had to see inside an abandoned dwelling that I had (again) photographed several years previously. I wanted to see if any of the things that made the scene seem melancholy to me were still intact. The place had since been boarded up, but one of the doors was still ajar, and sure enough there was the shirt and hat hanging on the pegs above the turned down bed in the ruined bedroom of a two room shack. It made the setting seem, somehow, even more wistful than it had been when Robin and I first stumbled upon it. So, I drove back toward the paved road promising myself that I would return again soon to photograph this place that I have come to love as much for the associations that it has as for the scenery. As anyone who knows me will tell you there is no such thing as a last photograph. Just south of San Luis I saw this image right along the edge of the road. For me, this says it all, while beauty is certainly in the eye of the beholder, I can’t imagine anyone seeing a sight like this and not being filled at least to a small degree with awe . We have had two major wildfires here in the Jemez Mountains over the last four years. Each destroyed well over 100,000 acres leaving large tracts of forest scarred with the burned skeletons of once majestic conifer trees. After a while, you get used to the desolation. It can even have its own kind of harsh beauty. 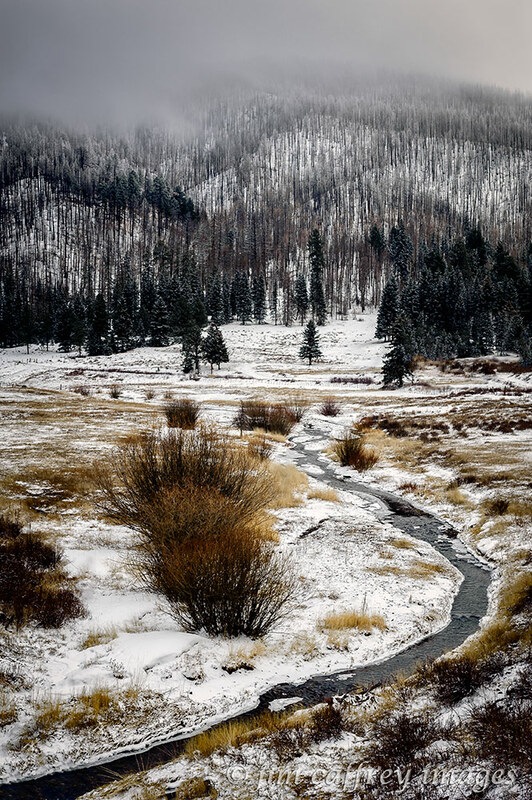 The East Fork of the Jemez River flows through Las Conchas where the 2011 Las Conchas wildfire started. Winter can be especially beautiful in a burn. 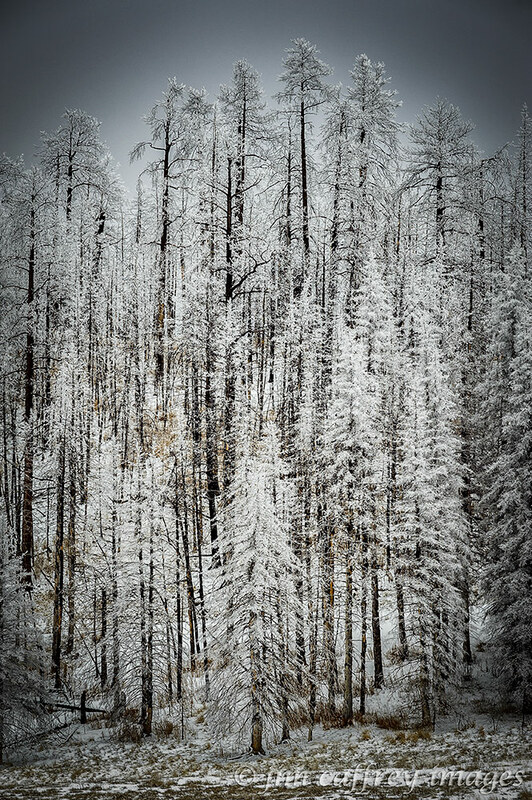 The tonal contrast between the white snow and the black, charred trees is striking. 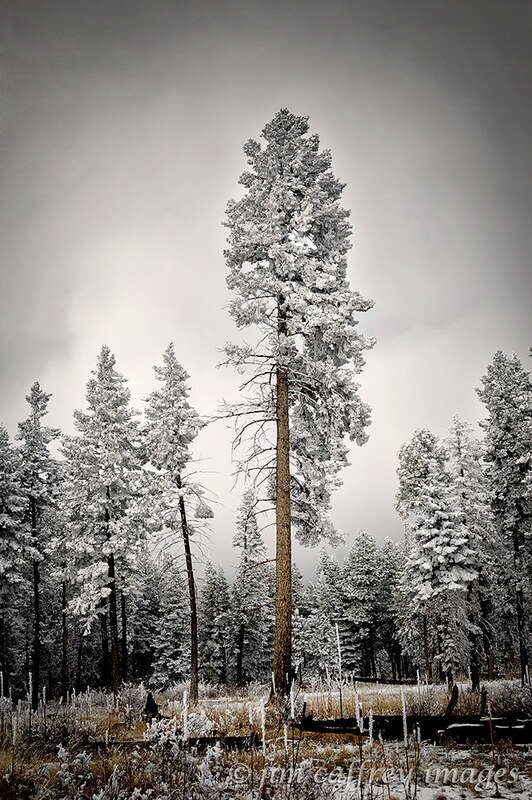 The textural contrast between the trees on a burned ridge and a lowering storm cloud provide strong elements and tell a story of loss reconciled by time and weather. We can use such conditions to make more compelling images. 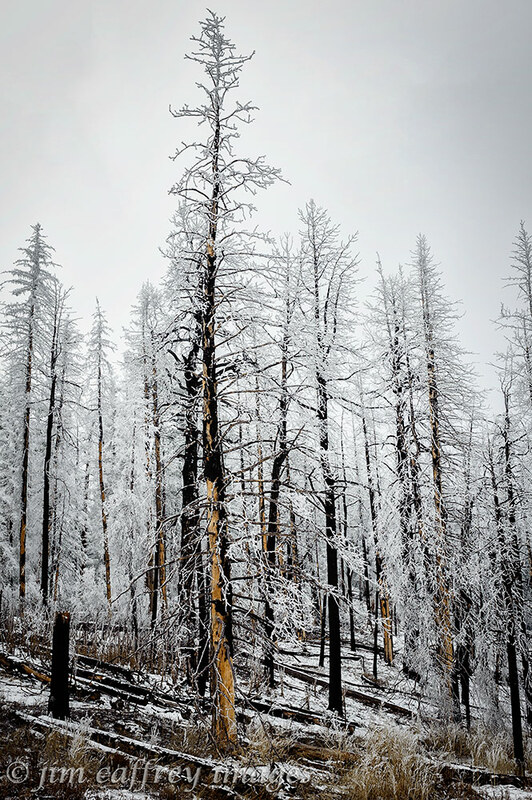 When conditions are right, the bones of the dead trees become coated with hoarfrost and are transformed into fragile, crystalline structures. You can almost hear the tinkling of their branches as they sag under the weight of the frost. When the sun breaks through a low-hanging bank of clouds, the light is transformed; it becomes, in a way, magical. The shadows and the mist of the clouds create a kind of frame that surround and isolate the area which is lit, making it the focal point of the composition. Cerro La Jara in the Valle Grande is illuminated by the sun through a break in the low hanging clouds that cover Redondo Peak which burned in the 2013 Thompson Ridge wildfire. Otherwise unremarkable elements of the landscape become worthy of attention when they are enhanced by a coat of frost. They come front and center when the rest of the scene is obscured by cloud cover. Such conditions reduce the clutter that would, under normal conditions, draw our attention away from them. 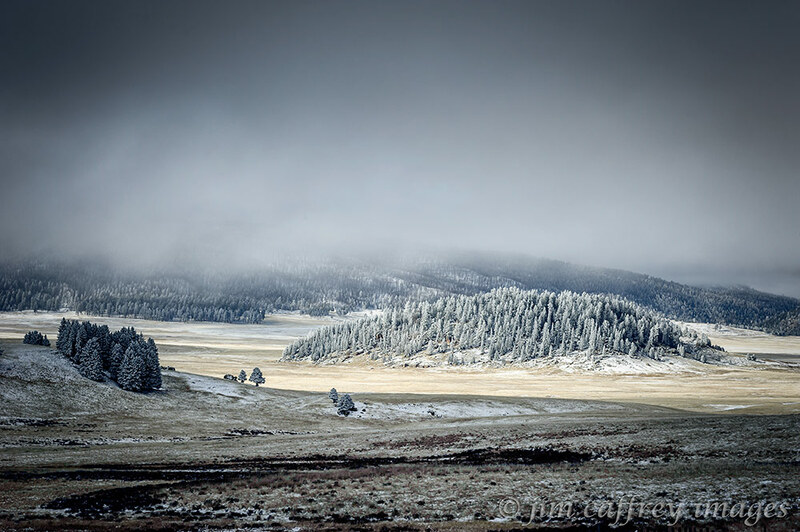 The last two images are successful only because of the low clouds which block the view of a conifer covered hillside. If we could see the entire scene, the trees in the foreground would become lost in the background of similar shapes and patterns. 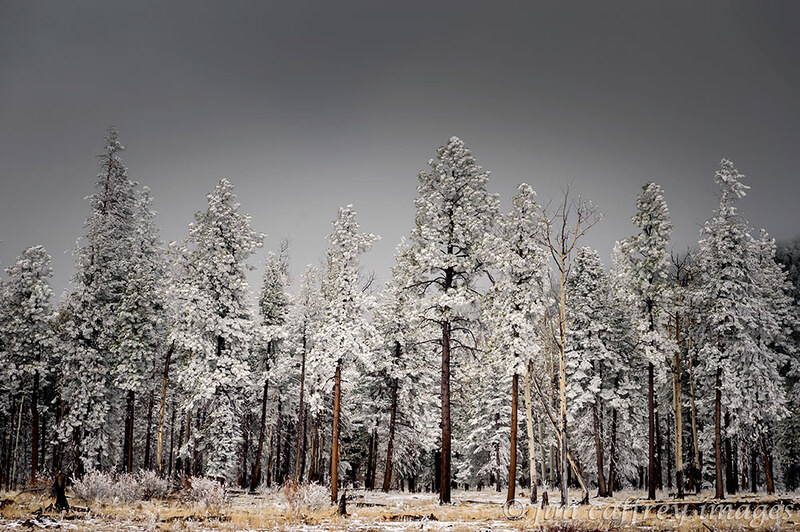 By using the softness and the simplicity of winter conditions, we can imbue otherwise unattractive or unworkable scenes with qualities that make them stand out, and render them more recognizable and appealing to the eye of a viewer.